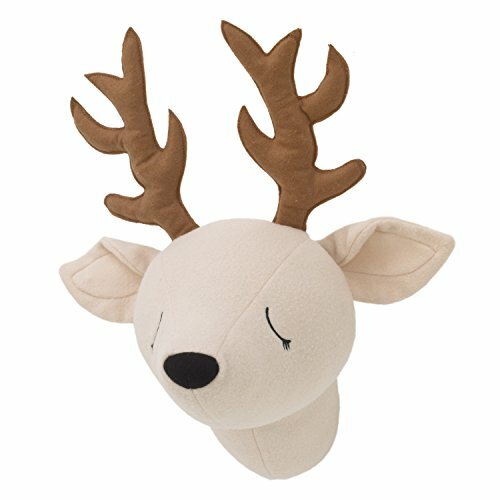 Bring the wonders of the woodlands to your baby’s space with the NoJo – Warm Beige – Deer – Plush Head Wall Decor. This warm, beige-colored deer features dark brown, dimensional antlers, dimensional ears, and sweetly embroidered eyes and nose. The NoJo – Warm Beige – Deer – Plush Head Wall Decor measures 14″H x 13″ L x 8.5″D and mounts easily with included ring. Perfect addition to my nephews nursery Item came as expected. It is even cuter in person. The only thing I was slightly disappointed in was the antlers were a little bent. I think it will fix over time as it sits on the wall. I would definitely order again though. Great addition to a little unicorn lovers room So cute! Great addition to a little unicorn lovers room! All4Babies is a participant in the Amazon Services LLC Associates Program, an affiliate advertising program designed to provide a means for sites to earn advertising fees by advertising and linking to Amazon.com, Endless.com, MYHABIT.com, SmallParts.com, or AmazonWireless.com. Amazon, the Amazon logo, AmazonSupply, and the AmazonSupply logo are trademarks of Amazon.com, Inc. or its affiliates.